University isn’t all research papers and study groups; it’s a time to explore, have fun and get out of your comfort zone. This is especially true for international students studying abroad at Manhattanville College, just 20 minutes by train from legendary New York City. While there’s no shortage of fun things to do in “the city that never sleeps,” is it possible to entertain yourself in NYC on a student’s budget? You bet! We’ll show you how. Visit Central Park – You’ve seen it in movies and TV shows and now you can step foot in the park yourself. More than a sprawling, green nature escape in the heart of the city, Central Park hosts free events and shows, not to mention good old-fashioned people watching. Take the ferry to Governor’s Island – This 172-acre island is just a free ferry ride away from Lower Manhattan. Ride bikes, play mini-golf or have a picnic on this scenic island escape. Visit the Bronx Zoo – You’ll pay admission every day here except Wednesdays, when admission is “pay what you wish.” Visit the African Plains, the Aquatic Bird House, the Himalayan Highlands, the Butterfly Garden and more, all without leaving NYC. Make the most of your time in the U.S. while studying abroad with Bridge in New York. You’ll be a short train ride away from one of the greatest cities on earth, where it’s possible to spend the day at museums, parks, zoos and more without spending a dime! 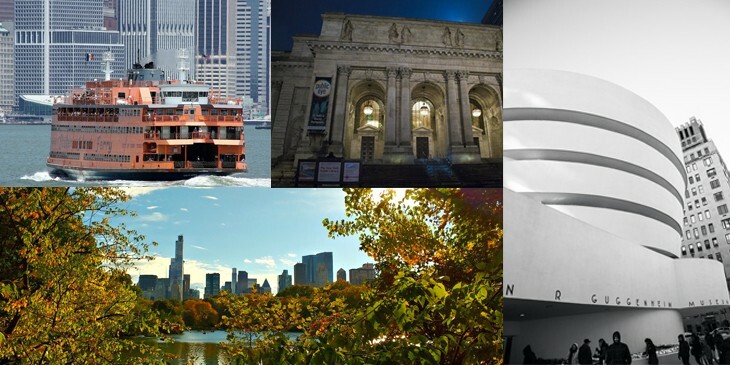 esl-blog BridgeEnglish in New York, esl-blog, Extracurricular Activities, Food and Drink. permalink.